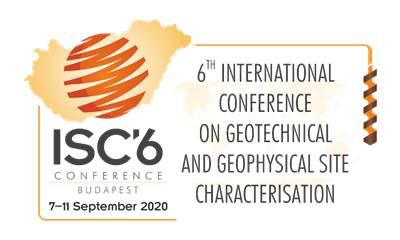 La sesta conferenza internazionale su Geotechnical and Geophysical Site Characterization – ISC’6, organizzata dal TC102 (Technical Committee for Ground Property Characterization from In-Situ Tests) della ISSMGE, si terrà a Budapest dal 7 all’11 settembre 2020. È aperta la call for abstracts, con scadenza il 1o marzo 2019. The ISC conferences are the major events in the life of ISSMGE’s TC102. 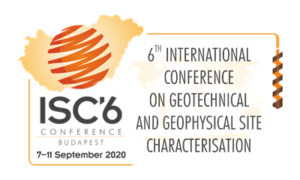 Since 1998, it will be the 6th time that geotechnical engineers and geophysicists from all over the world will gather and share their knowledge and experiences. Besides the conventional site characterization topics, the conference will also focus on some other recent challenges. As numerical modelling plays a more important role in geotechnical practice, there is an increasing demand for links between in situ test results and material model parameters. Some recent research projects in this field (e.g. sophisticated numerical analysis of in situ tests) are very promising, thus a proper forum for discussing those results may be an important starting point in these areas. A special session will be dedicated to this topic which aims to facilitate cooperation between specialists in both fields. Another important aim is to facilitate more active cooperation between geotechnical engineers and geophysicists. While the combined use of the two disciplines can be very beneficial, the use of geophysics in everyday geotechnical works is still limited. In addition to having a session for geophysical testing, we are planning another special session dedicated to potential benefits of cooperation between these two fields, where best practices are presented and discussed. Such a forum may be beneficial for both geophysicists and geotechnical engineers. The ISSMGE Technical Committee TC102 – Ground Property Characterization from In-Situ Tests in cooperation with the University of L’Aquila, Italy has instituted the Silvano Marchetti Award (SMA) in memory of Professor Silvano Marchetti (1943-2016). The award is funded entirely by Studio Prof. Marchetti, Italy. In occasione del prossimo convegno organizzato dall’AIMETA (Associazione Italiana di Meccanica Teorica e Applicata), che si terrà a Roma Sapienza dal 15 al 19 Settembre 2019 (http://www.aimeta2019.it/), è stato organizzato un Mini-Simposio, proposto da Claudio Tamagnini, Cristina Jommi e Angelo Amorosi, dal titolo “Theoretical, Numerical and Physical Modelling in Geomechanics: from the micromechanics of granular materials to geotechnical engineering applications”. È possibile inviare sommari entro il 28 Febbraio 15 Marzo 2019, seguendo le indicazioni riportate in http://www.aimeta2019.it/autori/. Le memorie (in lingua inglese) saranno pubblicate da Springer nella serie “Lecture Notes in Mechanical Engineering”, indicizzata in Scopus e WOS. Si auspica una qualificata e numerosa partecipazione all’evento. The Laboratory of Soil Mechanics at École Polytechnique Fédérale de Lausanne (EPFL) is currently looking for two PhD students and a Postdoctoral researcher to conduct research in THM testing and modelling of geomaterials as part of research activities on nuclear waste storage. The positions are open as of January 1st 2019, or upon agreement. More information on these positions can be found in the attached document. Interested candidates should submit their application to recruitment.lms@epfl.ch.